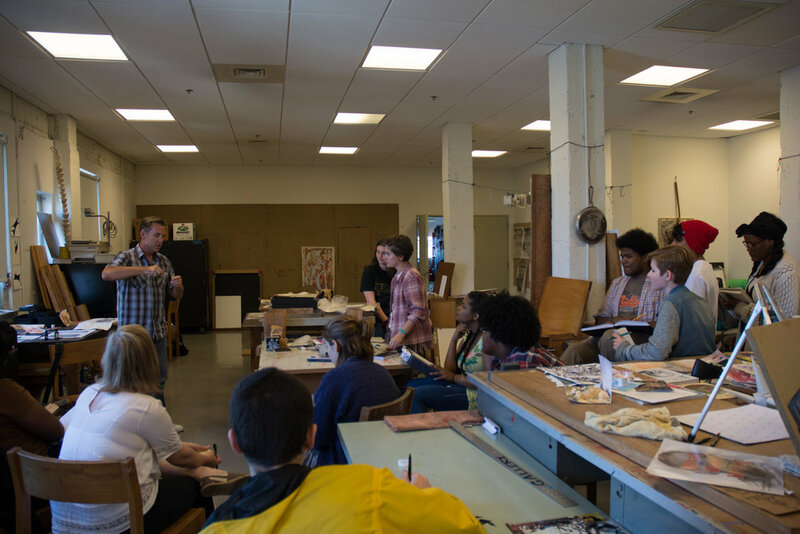 Not long ago I did a masterclass at the Baltimore School for the Arts. The topic of the class was “Translating the Senses.” There’s plenty of scientific data that supports the idea that we have more than five senses, and that, at least in healthy individuals, our senses often interact. This obviously affects our perceptions of reality. My thought for the masterclass was, instead of waiting for a paradigm shift to tell us, as artists, that it’s ok to proceed accordingly, that we should begin to reconsider how our sensory modalities work together to shape our somatic understandings of the world. So at BSA I gave a lecture on the science of smell, followed by exercises in smell/color, smell/texture, and smell/shape synesthesia. 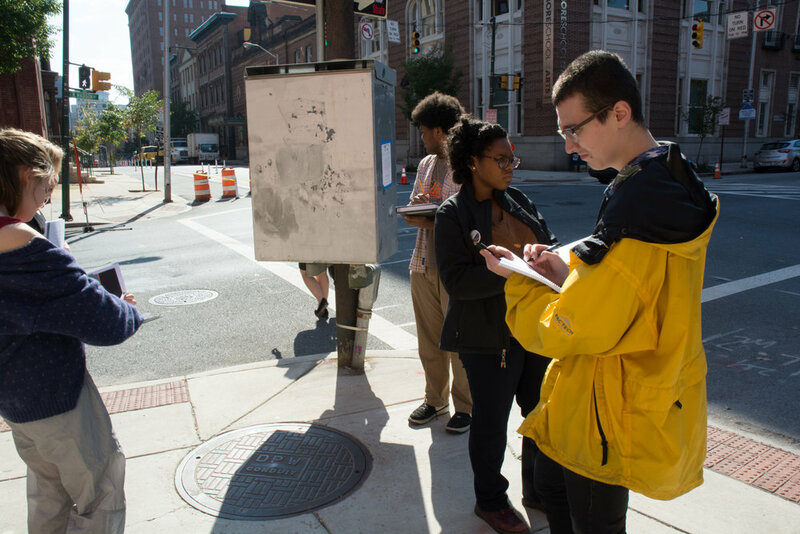 The exercises were to aid us in a “smell walk” that we would take throughout downtown Baltimore. Students were charged with notating “smell-scapes,” which I defined (with the help of Douglas Porteous’ pioneering text of the same name) as fragrances that evoke a distinctive background smell describing the sky and ground, along with episodic smells that reveal themselves over time. After the smell walk, we returned to a studio and began to translate the scent-scapes into graphical notations that would eventually be used in the construction of a smell map. Most maps are representations, usually on a flat surface, of the features of an area of the earth, showing them in their respective forms, sizes, and relationships according to some convention of representation. Usually, maps represent visual/physical terrain. But when thinking about about “mapping” other senses, it’s useful to let go of certain Cartesian formalities. At least at first. Students’ smell maps were highly subjective but shared many commonalities, though that is the subject of another post. The sort of sensory mapping mentioned above is beginning to gain momentum in art, design, and related fields. I have been using it in my university teaching (both art and non-art courses)for four or five years. I think it is an interesting perceptual exercise, which can generate data that is useful for more critical reflection and debate. I find this true particularly as it relates to an interdisciplinary understanding of place. Currently, I am working on mapping the intersection between people and place by superimposing archives of scent memories of a place onto sensory maps of that place. The map and the archive work together to create an objective and subjective olfactory portrait of the city; the map notates regional smells, while the archive collects personal stories about how the sensorium shapes the city’s cultural identity. I’m still experimenting with digital and analog interfaces for this, which is both frustrating and exciting. Frustrating because it takes time away from other exhibitions. But exiting because it finally unites some of my long-term research interests: sensory studies, participatory archives, citizen science, and multisensory storytelling.